Pokemon Go is an open world adventure featuring augmented reality mons that you can encounter and capture in real world locations. It's a free to play game essentially but if you really want to strive to be a Pokemon master there are premium upgrades that can help you level up faster and catch more Pokemon. The game is playable globally on both iOS and Android. It's without doubt that Pokemon Go has been the most talked about game in the last couple of decades with July 2016 seeing Pokemon fans old and new alongside people who had never even played the core series games walking the streets with their heads stuck in their phones like something out of the walking dead. The game very much bought back a 90's level of Pokemania to the fore and put Pokemon back in the mainstream public eye; it also rendered people unable to log into their social media feeds without seeing a picture of an Abra on the toilet, a bellsprout in a flowerbed or a Machop riding someones cat. There is an official Pokemon Go accessory called the Pokemon Go plus which enables players to catch Pokemon and rack up kilometers without having their phones out. Like in the core series games the player is introduced to the game by a Pokemon Professor, this time in the form of Professor Willow who will allow you to choose between the traditional three first generation starter Pokemon; Charmander, Squirtle and Bulbasaur. Once the trainer has taken their first Pokemon the game is essentially played by loading the App on your mobile phone and walking around the real world. The types of places you go have some influence on the types of wild Pokemon you will encounter for example if you are near bodies of water you are more likely to encounter water types, grass and bug types might be a little more inclined to spring out and attack you in parks and fields. As the player walks around their phone will vibrate when a wild Pokemon appears and clicking/tapping on the Pokemon will begin a confrontation with that Pokemon and give you the chance to throw some Pokeballs at it in attempt to capture it for your team. The higher the Pokemon's CP level the more difficult it may be to catch.. how difficult a Pokemon will be to catch is indicated by the color of the ring around the Pokemon just before you throw the ball with a red ring indicating that it's very unlikely you'll catch it, a yellow ring being 50/50 and a green ring indicating it shouldn't put up too much of a fight. As the player levels up and progresses in the game they'll get hold of berries and better quality Pokeballs such as Great Balls and Ultra Balls to make higher level Pokemon easier to catch. The higher the players level the stronger the Pokemon they will encounter in the wild. Once a Pokemon is caught not only do you add that Pokemon to your Pokedex and team but you also gain Stardust and Candies. Stardust is used in conjunction with candies to power up a Pokemon and help raise its CP (combat power). Raising a Pokemon's CP will in turn result in a raise of it's vital stats like HP, attack power, defence and so on. 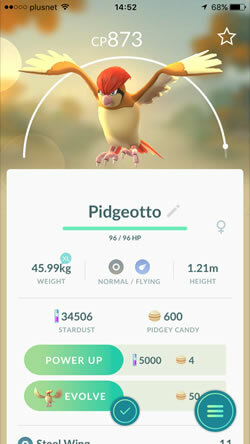 A little bit more of an explanation on how candies work; each Pokemon has their own kind of Candy so catching a Pidgey will give you Pidgey candy, catching a Scyther will give you Scyther Candy and so on. The number of candy you get from a catch depends on the level of evolution the target Pokemon was at. 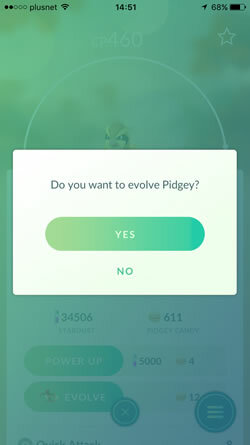 An unevolved Pokemon will award three candies, a Pokemon in it's middle evolutionary stage will give 5 and a fully evolved Pokemon such as a Pidgeot will give 10. When the game first launched all levels of Pokemon simply awarded 3 candies regardless of evolutionary state. Additionally transferring any Pokemon to Profesor Willow will grant another Candy. So as I mentioned above you can use stardust and candies to power up a Pokemon's CP level. Candy's on there own however can be used to evolve Pokemon; the cost of those evolutions can be as little as 12 candies for basic evolutions such as Pidgey to Pidgeotto, Caterpie to Metapod and go right the way up to 400 candies for the most advanced evo's like Magikarp into Gyrados. Evolving Pidgey's.... you'll get used to it. PokeStop's are essentially real world landmarks which appear as a blue marker on your map - these could be anything from statues, to public houses, restaurants, supermarkets and you can tap them ingame and spin the PokeStops image to recieve items such as Pokeballs, Berries and even Pokemon Eggs. The PokeStops are refreshed and can be re used every five minutes. Every player starts the game with an egg incubator that can be used an infinite amount of times but can only incubate one egg at a time. If the player is lucky enough to get a Pokemon egg from a PokeStop they can put the egg into the incubator and walk a certain distance to hatch it. Eggs come in 2km, 5km and 10km versions and the version you have will affect what Pokemon you can get from it. 10km eggs have the potential to hatch the rarest and most powerful Pokemon... and I should think so too if you have to walk 10 kilometers to hatch them! 2km eggs have the chance to hatch common Pokemon like Ratatta, Pidgey and so on but also have the chance to hatch the starter Pokemon which are all fairly sparse ingame so don't discount these eggs entirely. 5km eggs offer fairly mid range Pokemon. Each time an egg hatches you not only have a new Pokemon for your team but you'll also get a big batch of stardust and the relevant Pokemon's Candy. Like PokeStop's gyms will often be found at real world landmarks and players will fight to control the gyms in order to obtain Pokecoins. A player is also rewarded with a basic level of XP for fighting for control of a gym or training at a friendly gym. 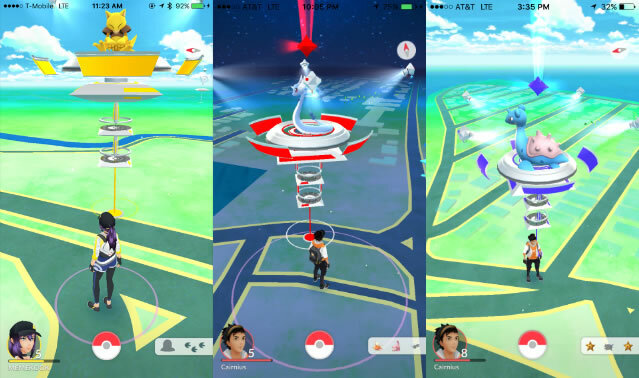 On June 23rd, 2017 Pokemon Go launched its overhauled gym system and added the raids feature. No longer do gyms work on prestige levels but instead defending Pokemon have a motivation level. Each time they are defeated they will become less motivated and weaker in battle until they are eventually knocked out. Motivation will also slowly decay over time even if no one is attacking the gym. Trainers who have a Pokemon stationed at a friendly gym can visit their Pokemon and feed them berries to keep their motivation and combat abilities up. They also changed the way you claim your defenders bonus and set a maximum 50 Pokécoin's per day limit. The maximum garrison in a gym is now six Pokémon as opposed to the 10 it was previously. Additionally gym's also act as PokeStops so you can obtain items from them exactly as you would a normal PokeStop except if your team control the gym you get a Team Bonus and recieve some additional items. 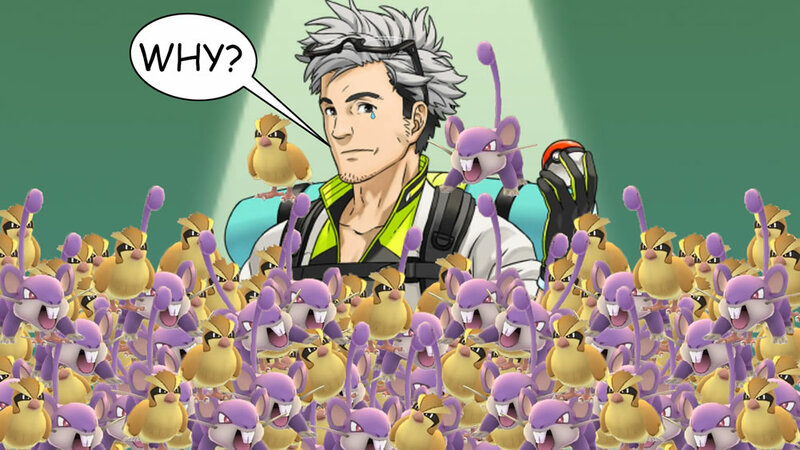 The introduction of the raids feature means every so often a higher than normal CP Pokemon of varying difficulty levels will spawn at a gym and it will often take multiple players to bring it down. All three teams can work together during these battles to bring down the most powerful mons. Want to know more? Click here for our guide to raids in Pokemon Go. When a player spars with the Pokemon at a friendly gym the gyms level of prestige is raised, the more prestige a gym has the more Pokemon can be stationed their from one team to defend it. Every 24 hours the trainers who have a Pokemon stationed at a gym can claim a Defenders Bonus by clicking the icon in the top right of the shop - this defenders bonus consists of 10 Pokecoins and 500 stardust per gym you have a Pokemon stationed at. 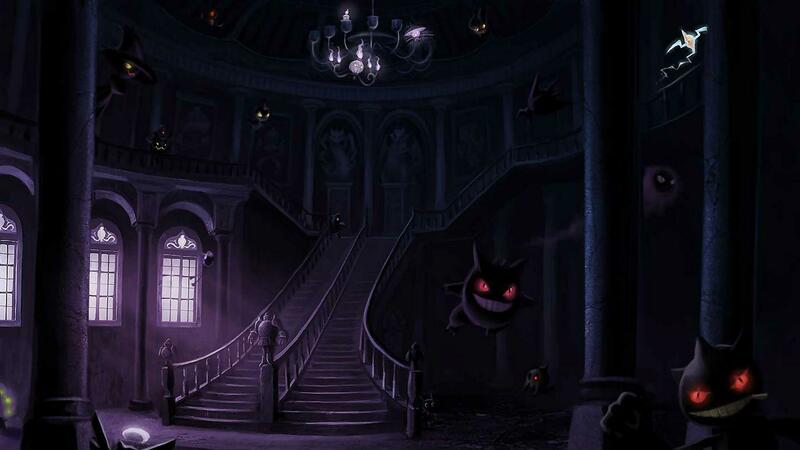 A maximum 10 Pokémon could be stationed at a gym at once. This feature is something else that wasn't around when the game was initially released, you can now choose a buddy Pokemon who will travel around by your side on your adventures and every 1km, 3km or 5km walked (depending on the Pokemon type) it will find a candy. It's best to have a rare Pokemon or a Pokemon you particularly want to evolve and power up as a buddy as they'll find their own candy type as you walk around. Bird Keeper - Catch 200 Flying type Pokemon. This awards a +3 flying-type catch bonus, meaning you have a better chance of catching high level flying Pokemon you encounter in the wild. Bug Catcher - Catch 200 Bug types. Again the same sort of bonus as above but for bugs. Whilst medals aren't something you can really proactively go out and decide to get hold of basically every Pokemon you catch will contribute toward a medal of some kind. 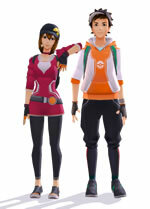 Pokemon Go offers a range of character customisation options. When you initially set up your character you can choose your hair, face and so on but there are further options ingame to choose from including hats, glasses, tops, bags, gloves, bottoms, socks and footwear. 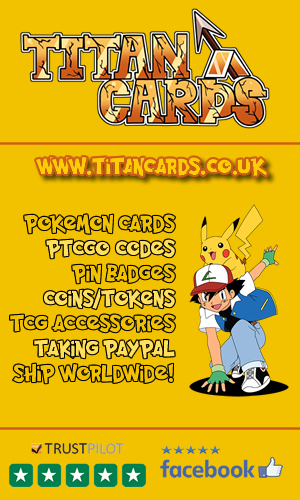 There are some things you can wear for free but other bits will cost Pokecoins for example tops which have your team's logo on etc... they aren't cheap! Well in short, no you can't. When Pokemon Go first launched back in July 2017 it was only first generation Pokemon in the game and even then not all of them... it's one year on and as I write this there have been no legendary or mythical Pokemon caught so far. Ditto for example was not initially available but was slipped into the game on November 23rd, 2016. Ditto can't be found as itself and often takes on the guise of common unsuspecting Pokemon such as Pidgey, Rattata, Zubat and Magikarp and your best chance of catching one comes simply from farming these more common mons. 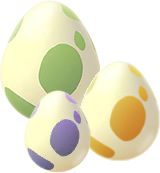 Less than a month later Gen II baby Pokemon were added to the game in the form of possible egg hatches. This included Cleffa, Elekid, Igglybuff, Magby, Pichu, Smoochum and Togepei. Pokemon Go's implementation of Gen II mon's was complete on February 16th, 2017 when the vast majority of Gen II were introduced into the wild. This update also enabled the evolution of any Pokemon from Gen I that cross evolves into Gen II (Scyther to Scizor, Golbat to Crobat for example) to occur. Additionally Togetic can now be caught in the wild but in most places is Ultra Rare. Shiny Pokemon made it to the game on the 22nd of March 2017 when Shiny Magikarp became introduced, Shiny Gyrados is also possible if you evolve the Shiny Karp when you have enough candies. Based on very limited research during the water festival this year it looks as though the odds of you getting hold of a Shiny Magikarp are about 1 in 400. Don't be disheartened that you can't catch them all just yet... it's without doubt that Legendary and Mythical Pokemon will be saved for special world events such as anniversaries etc. And I dare say Gen III is in the pipeline already. 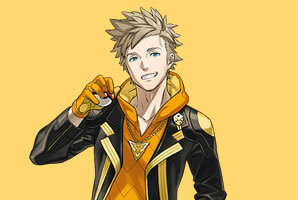 Team Instinct is the Yellow Team and is led by Spark. The teams sigil features the Legendary Bird Zapdos. Team Valor is the Red Team and is led by Candela. Moltres is the chosen legendary bird for their teams sigil. 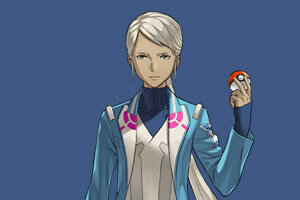 Team Mystic is the Blue Team and is led by Blanche and the Legendary Bird which represents the team is Articuno. Once you've chosen a team it's currently permanent so be careful. So lets say you join Team Instinct, when you next go to a gym if it's already under your teams control you can battle/spar at that friendly gym to gain a little XP but also to level the gyms prestige level whereas if it's an enemy gym controlled by Valor or Mystic you will want to battle the gym and for every Pokemon you beat that gym will lose prestige until it becomes neutral enabling you to take the gym over for your team. Another time when you'll be working with your Team's leader is when you want your Pokemon appraised. You can lean on the expertise of your Team Leader to provide you with information on your Pokemon's stats, combat abilities and attributes. Why would you want to do this? well let's say you have two Pokemon of roughly the same CP level and can't decide which to evolve the best course of action is to appraise both and evolve the one with the better combat ability appraisal. This is especially important if you are intending to be involved in gym battles. Giving a good overall impression of your Pokemon's combat abilities. This appraisal will tell you how much of a stat bonus the mentioned Pokemon has for it's best stat. The appraisal system wasn't originally in the release version and was added in update 0.35.0. As well as combat abilities your Team Leader will also comment on how big or small your Pokemon is but it's unclear as to whether the size/weight of a Pokemon has any affect on anything as yet. In Pokemon Go it's the player that earns XP and levels up as opposed to his/her Pokemon. Naturally most trainers are going to want to get stronger quickly in order to encounter and command more powerful Pokemon. The level cap currently sits at 40 and it takes a colossal amount of XP to get there. Here are some basic tips on where you are going to get that XP from. You gain 100 XP for every Pokémon you catch. If it's a new entry to your Pokedex you get a further 500 XP. Additionally you also get a further XP bonus for different types of throws as detailed in the next section. 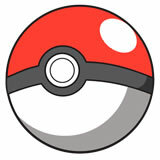 If you catch a Pokemon with the first throw of your Pokéball you gain 50 XP. The first throw, curveball and one of Nice, Great or Excellent XP bonuses do stack. So for example if you throw a curveball for your first catch and it hits inside the targetting circle for a Nice throw you'll get 50XP + 10XP + 10XP = 70XP throw bonus in addition to the usual 100 XP for catching a Pokemon. If you're really serious about getting that level up the short story is that you want to catch as many Pidgey, Caterpie, Weedle as possible. The reason you want these is because a) they're really common and easy to find in large quantities in most places and b) it only takes 12 candies to evolve them. Each evolution will award you 500 XP and if it evolves into a Pokemon you didn't have in your Pokedex that'll net you another 500 XP so 1000 XP total not bad eh? A common tactic for levelling up quickly is to farm lots of Pidgey, Caterpie, Weedle then pop a lucky egg which doubles your XP for 30 minutes and evolve them all. This makes it up to 1000 XP per evolution. 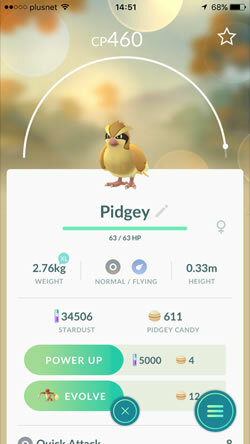 I would recommend holding onto as many Pidgey and Pidgey candy as possible; waiting for special events and festivals ingame where they have a double XP bonus drop a lucky egg then and you are talking 2000 XP per Pidgey evolved. Like with evolutions if the Pokemon you hatched is a new addition to you're PokeDex you'll also get another 500 XP bonus on top for a new discovery. First catch of the day. The first Pokemon you catch each day will award a 500 XP bonus, complete this daily mission 7 days in a row and on the 7th day that bonus goes up to 2500 XP. As an additional bonus you'll also get 600 Stardust per day for the first 6 days, and then 3000 stardust on the seventh day. First PokeStop of the day. The first PokeStop you visit each day will award a 500 XP bonus and lots of items, visit at least one PokeStop a day for 7 consecutive days and get a 2500 XP bonus on the seventh day as well as a special item and lots of PokeBalls and berries. Watch out for special events. Most of the events we've seen in the first year of Pokémon Go have featured XP bonuses of some kind be that a generic overall double XP bonus, a big bonus on catching Pokemon with good throws etc. These events can help you decide when to play more actively and when to blow those lucky eggs and evolve new types etc. The currency in Pokemon Go is Pokécoins. Pokécoins can be earned by occupying gym's and claiming your daily defenders bonus (ten pokécoins per gym occupied at the time of claim) these coins can only be claimed once every 24 hours in this manner. Pokécoins can also be purchased with real world money. Check out the prices for Pokecoins below if we look at how these currencies convert some countries certainly get a better deal than others. A list of all the items in Pokemon Go, what they do and where you can obtain them. I've split the tables into categories ie battle items, berries, special items etc. Medical items for reviving and healing your Pokemon after a gym encounter. There are currently three types of Pokéball available in Pokemon Go. Standard Pokéballs are the only ones which can be purchased in the Shop whereas the other two balls must be obtained from PokeStops. Berries can help you capture Pokemon more easily or increase the candy reward. Nanab berries are best used on aggressive Pokemon or ones that dart about quickly such as Zubat. These special items are recieved if you complete your daily PokeStop visit for 7 consecutive days. On the seventh day your first PokeStop will award one of the below items as well as the usual abundance of standard items and XP. These items can sometimes be obtained for free by hitting certain milestone levels but for the most part if you want em, you gotta get your hands in your pockets! Player's who have been spending money on the game hit level 40 a long time ago by combining 9x Incubators and the use of a lucky egg just before the nine eggs were due to hatch for huge XP bonuses. It should be noted that all players start with one egg incubator that can be used an infinite number of times. Egg Incubator None A device that incubates an Egg as you walk until it is ready to hatch. Breaks after 3 uses. Bag Upgrade None Increases the max number of items you can carry by 50. Storage Upgrade None Increases the max number of Pokémon you can carry by 50. These gift box items are seasonal, limited time items. I would expect that they will return for Christmas again this year in one form or another. Ultra Box None 20 Ultra Balls, 25 Incense, 6 Egg Incubators. Bronze Box None 100 Poké Balls, 8 Lure Modules. Silver Box None 8 Incense, 8 Lucky Eggs, 8 Lure Modules. Kallie Plagge from IGN scored the game 7 out of 10 and described it as "A simple collection game made memorable by its community experience." The Guardian's Kat Brewster described it as "as "not a good game, but a great experience" and scored it 2 stars out of 5. Metacritic currently has Pokemon Go at a score of 68% across it's aggregation of 36 critics scores (true 16/06/2017). The game also won the award for most discussed game of the year and most shared game of the year on Metacritic. GameSpot's Miguel Concepcion gave Pokemon Go a 7 out of 10 in his review and commented "When it works, Pokemon Go feels like a natural evolution for the series". It should be noted that these reviews are from July 2016 when the game launched, if they were to be written now I think they'd be different as most of the consensus of the reviews is that the game is bad, buggy, broken and the servers can't cope but the social experience when it worked was great. The situation now as I write this a year on is that a lot of stuff has been fixed, the game has been enhanced but the novelty social experience that was associated with the game at launch has diminished. It would be interesting to see what the same reviewers would score the game a year on. Opinions on Pokemon Go remain mixed due to issues with massive dominance of certain teams in some areas and a gym system which further contributes to this misery, an abundance of spoofers who cheat their way to the best Pokemon etc have contributed to a reduction in playerbase since the game launched. However since launch Niantic have introduced various improvements and special events to make the game more enjoyable for those who still play it (approx 5 million daily active players as of April 2017). Check out these Pokemon Go videos, trailers, commercials and more. The official launch trailer for Pokemon Go. "Get up and Go!" December 2016 announcement trailer for Togepei and Pichu being added to the game. The July 2017 launch trailer for the Legendary Birds. 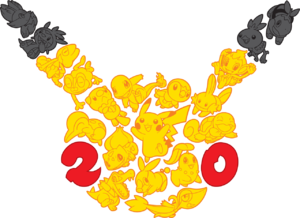 The game was released in celebration of Pokemon's 20th anniversary. The idea for the game was conceived in 2013 by Satoru Iwata of Nintendo and Tsunekazu Ishihara of the Pokemon Company as an April Fool's Day collaboration with google called Pokemon Challenge. At the time they had worked with Tatsuo Nomura from Google Maps who has since become a senior project manager at Niantic. It was decided to create the Pokemon Go plus accessory rather than add an app to smartwatches because that would have limited the player base to those that could afford smartwatches. Or it would've certainly given them an unfair advantage. A Japanese exclusive beta test was announced on March 4th, 2016 for Pokemon Go in an effort to eliminate bugs etc from the game prior to it's full release. 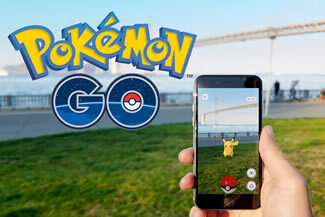 When the game released in the first few countries it was so popular that the servers were regularly overloaded and John Hanke, Niantic's CEO said release to the remaining regions would be delayed while they fixed the issues. Within 24 hours of it's release in the USA Pokemon Go had topped all App store charts for free games and top grossing apps. The incredible popularity of Pokemon Go resulted in a 10% share price increase for Nintendo and days later by July 11th this figure had risen to a 23% increase. Within 2 days of release Pokemon Go had been downloaded to 5.6% of all Android devices in the USA. Even more than Tinder. Stats provided by Similar Web say that over 60% of people who downloaded Pokemon Go in the USA are/were using it daily. On launch day a player in Wyoming wandered off the beaten track in search of Pokemon and was walking alongside a river where they discovered a dead body. Meanwhile in O'Fallon, Missouri a shocking ELEVEN teenagers were subject to armed robbery by a group of guys in a black BMW at a shopping centre. O' Fallon Police department apprehended the four suspects later that evening who then went on to admit they were using ingame lures to attract Pokemon and thus Pokemon Go players. Plays of the original soundtrack of the Pokemon Animated series increased by 362% across the glove following the games release. Some of Pokemon Go's soundtrack was composed by Junichi Masuda. To celebrate the first anniversary of Pokemon Go, Niantic announced the games first major event; Pokemon Go fest in Chicago. The event was held on 22nd of July 2017 and very much didn't go to plan, with huge queues to get into the arena due to single file security searches followed by major technical difficulties and thousands of fans booing Niantic CEO John Hanke pretty badly when he came on stage. Some fans even saw fit to file a lawsuit against Niantic in the wake of the disastrous event. In the wake of the disaster that was Pokemon Go fest, Niantic appeased fans somewhat with the release of Legendary raids. The first legendary raids began on July 23rd 2017 with Articuno and Lugia; Articuno was chosen from the original trio of legendary birds due to Team Mystic contributing the most to a global catch 'em all event on July 22nd. Articuno was only around for a week, with it's final appearance coming on 31/07/2017. Moltres was released from 1st of August 2017 to the 8th of August 2017 and is planned to be followed up by Zapdos. The Legendary Dogs were released on 1st September 2017; Entei, Raikou and Suicine are now all available in raids across the globe; but on a rotation system. Europe and Africa got Entei first, The Asia Pacific Region begins with Suicine and the America's get Raikou. Each mon will stay in its starter region for a month before rotating. Eventually all regions will have had a chance to obtain all three of the Legendary Dog Trio. Alright, so this article gave you the basics on Pokemon Go, check out the links below for more advanced stuff and other special articles to help you on your way.